Like any movie in the Marvel canon, Paul Rudd’s Ant-Man has a ton of Easter eggs, whether it’s the presence of Casey Lang, who grows up to be Giant-Woman, or a cameo by Garrett Morris, who donned the Ant-Man suit for an SNL skit in 1979. But of all the hidden gems Marvel could’ve placed within their latest superhero flick, this one seems like a missed opportunity. There’s a moment, even a slight moment at that, where Ant-Man can easily crossover with Zoolander. A hat tip to Reddit user westmontblvd for making this comparison, and also be wary of minor spoilers from the film. There’s a scene towards the beginning of Ant-Man in which Hank Pym (Michael Douglas) is invited back for a special presentation at his company by his former protege, Darren Cross (Corey Stoll). Cross is now running Pym Industries, and he wanted the man who started it all to be present when he debuted the new direction of his company, now called Cross Industries. 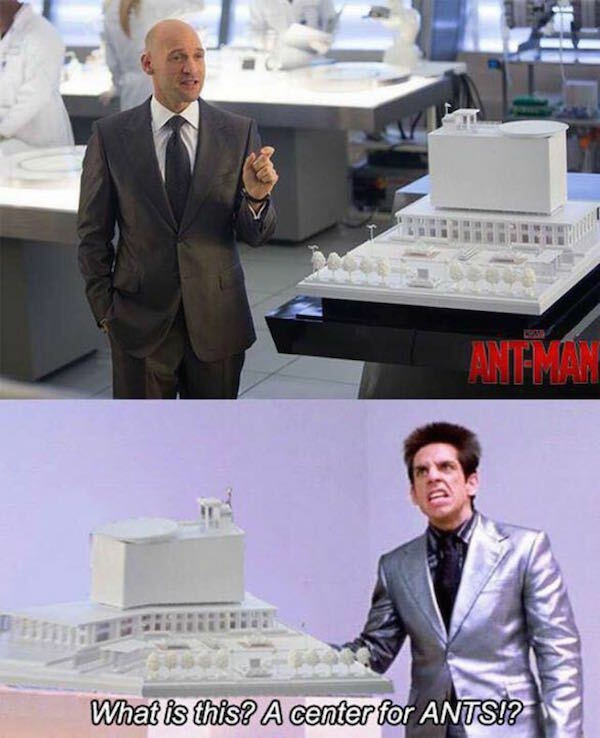 Cross unveiled a miniature model of what the new building design will look like, and that’s when westmontblvd thought of Zoolander. Check out the Photoshopped crossover that should’ve been. The building model shown in Zoolander for Derek’s Center for Kids Who Can’t Read Good is completely different from the design sitting in front of Cross, but now that it’s been pointed out, you can’t unsee it. The scene in question from the Ben Stiller comedy occurs when Mr. Mugatu (Will Ferrell) is trying to recruit Derek for a campaign, though he really has ulterior motives. To try and persuade him, Mugatu shows the dimwitted fashion model plans to create his passion project, a center to help teach children how to read. Derek, being the simple but beautiful human that he is, flies into a rage in mistaking that this model was to scale. Watch his freakout below. See how perfect an Easter egg for this moment would’ve been? Maybe it would’ve been enough to increase the film’s box office numbers even more. While Ant-Man is still the number 1 movie in America, its revenue is still low when compared to other Marvel movies; it marked the lowest opening weekend debut for the studio since 2008. The Edgar Wright fiasco didn’t help matters much, but some other issues involved the portrayal of Hope van Dyne (Evangeline Lilly), who, even though is obviously more qualified to handle the mission at hand, is still left in the shadows of the men around her. Even George R.R. Martin, a self-proclaimed Ant-Man fan, took issue with the repetitive villains that populate this universe. We'll see Paul Rudd return as Ant-Man in Captain America: Civil War and Marvel's Kevin Feige said there are bigger plans for Hope down the road, so there's hope some of these issues can be rectified. And with Zoolander 2 happening, could a real crossover ever be in the cards?